Because Hawaii has so many agricultural regions, you will find many fresh ingredients. Food traditions in Hawaii have been influenced by ancient cooking methods such as cooking a pig in an underground oven called an imu and adding banana leaves, breadfruit and sweet potatoes. One Hawaiian tradition is to mark the one year old birthday of a child with a backyard lau with pig cooked in an imu. Hawaiian food has been influenced ethnically by the Portuguese, Japanese, Korean and Chinese cultures. First port... great culinary experience! First stop: Oahu, Hawaii! Even though we were only in Hawaii for just one day, I got the opportunity to try two trademark foods of the state. I had lunch at Dukes, which is a famous local beach bar restaurant. I had a very hard time deciding between the tuna poke and the street tacos. Even though both sounded amazing, I ended up going with the tuna poke. Tuna poke is diced into cubs and can be served in a variety of ways. This particular dish came served on 3 large crackers with tuna, avocado, chipotle aioli, and jalapenos on top of the crackers. They also brought a bowl of rice to accompany the dish. The fish was extremely fresh and all the different flavors mixed really well together. 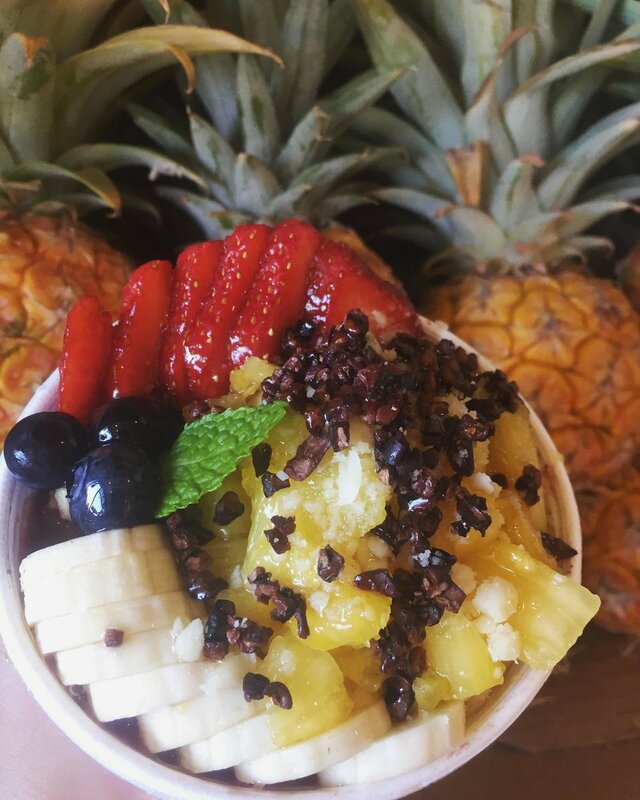 The second thing I tried was an acai bowl from Crown Pineapple plantation. The presentation of this bowl was beautiful with lots of fruit on top. This acai bowl had many components. On the bottom, was a layer of crunchy granola. Next, was the acai. Then there was another layer of granola and all the fruit. Finally. It was topped with honey and chocolate bits for even more flavor. The acai bowl tasted even better than it looks. I absolutely loved the food in Hawaii and cannot wait to go back and try even more. I thoroughly enjoyed visiting Hawaii for the first time. My experience with the people, the island and especially the food have made me want to return to theisland in the near future. We stopped at a small shrimp farm/restaurant called Fumi's on the side off the road in the middle of Oahu North Shore to try some local cuisine.It was obviously a good choice as it was very busy with many locals even at 2 pm. I selected the coconut shrimp dish which consisted of six freshly made coconut shrimp, two mounds of jasmine rice, a small side salad, and a slice of freshly cut Hawaiian pineapple. All together the dish was the perfect representation of the local foods and culture and was served right at the location of the shrimp farm. We finished off the lunch with a Dole pineapple soft ice cream which was both sweet and tart. A perfect finale!